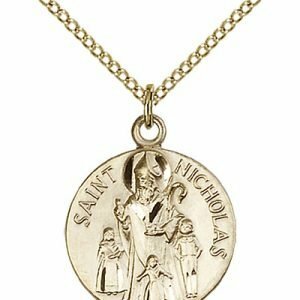 The best known story of St. Nicholas is one where he secretly threw bags of gold down a chimney in order to help a poor family’s daughters be able to marry rather than be sold into slavery. St. Nicholas was admired by the people of his town, and his burial site is still a popular place of pilgrimage today. St. Nicholas’ feast day is celebrated on December 6. He is often depicted as a bishop in art, usually surrounded by children. Most people associate St. Nicholas with Christmas, Santa Claus, and gift-giving. But why? How is this particular saint connected to the legendary character? 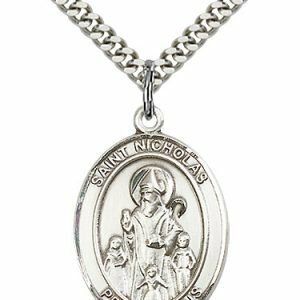 St. Nicholas was born in the third century in Patara, which, at the time, was a part of Greece (but is now present-day Turkey). He was brought up in a wealthy and very devout Christian family. While still young, his parents died in an epidemic, leaving Nicholas an orphan. Nicholas gave his large inheritance away to the poor and needy. 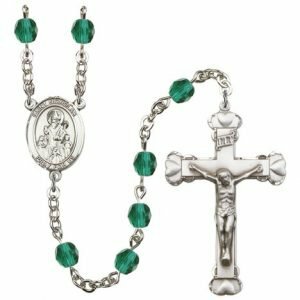 When he was old enough, he was ordained a priest, and later became the bishop of Myra. The people of Myra admired him for his generosity and love of children. He was also particularly concerned for the safety of sailors, since Myra was a port town, and many of the villagers took to the seas to make a living. 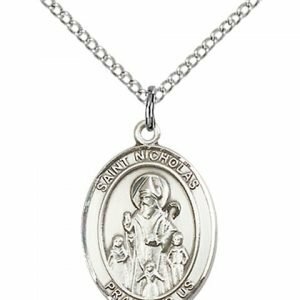 There are many stories about St. Nicholas that show his characteristic selflessness, as well as his devotion to the protection of children. One such story is of an impoverished father who had no money to offer as a dowry for his daughters to get married. In those days, a woman had to offer a dowry to her groom in order to be considered for marriage. When dowry money was unavailable, the woman would be considered unmarriageable, and would often be sold into slavery. This man had three daughters and no money for any of their dowries. Horrified at the thought of having his daughters sold into slavery, the man prayed for help. St. Nicholas heard of the man’s plight, and, on three separate occasions, secretly threw a bag of gold down the man’s chimney. The bags of gold landed in the stockings/shoes of the family members who had placed them near the fireplace to warm. The man was able to offer the dowry his daughters needed in order to marry, saving them from ending up as slaves. Because of this story, children began placing their own stockings and shoes near their fireplaces in hopes that St. Nicholas would leave them a gift. Another story of St. Nicholas is that he was once traveling by sea to the Holy Land to see where Jesus had lived and died. While sailing, a strong storm caused the waters to become dangerous, and the sailors were frightened. St. Nicholas prayed for the seas to calm, and shortly thereafter, he did. 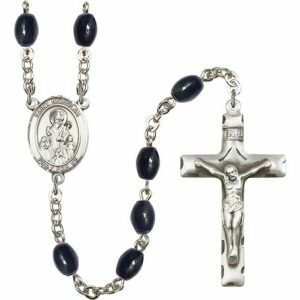 It is due to this story that St. Nicholas is considered a patron of sailors and those traveling by sea. 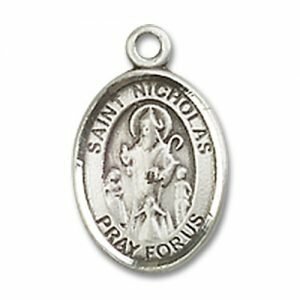 St. Nicholas attended the Council of Nicaea in 325, in which he fought against a heresy that a man named Arius was spreading. This heresy said that Jesus the Son was not equal to God the Father. 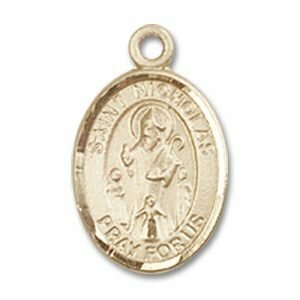 Many bishops listened to Arius and were close to agreeing with his position until St. Nicholas presented the truth to them, at which point the bishops agreed with St. Nicholas. The Nicene Creed, which is recited at the Catholic Mass, was written in response to what was determined as truth at this council. 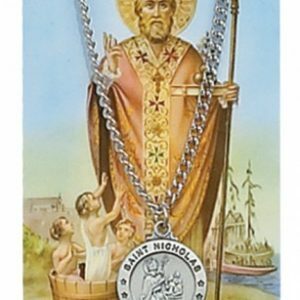 St. Nicholas died on December 6, 343 in Myra. His body was buried in the cathedral. Due to turmoil in the land, in the year 1067 his relics were moved to Bari, Italy, where many of them remain today. His body exudes an oil to this day (called the “manna of St. Nicholas”) which is said to have healing properties. The site of his burial in Bari is a popular location for pilgrimages. St. Nicholas’ feast day is celebrated on December 6. The most common custom draws from the story of St. Nicholas delivering the bags of gold through the chimney and many children will leave their stockings or shoes out in hopes of receiving a gift from St. Nicholas. 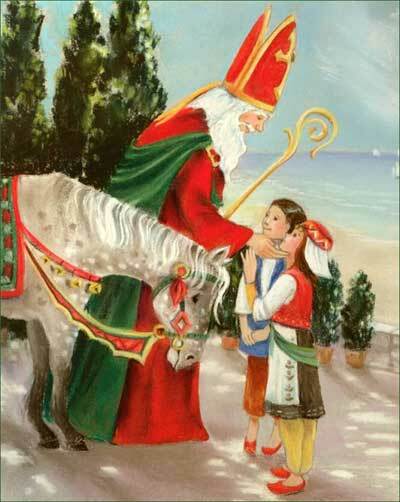 In some languages, St. Nicholas’ name sounds similar to “Santa Claus.” This is a part of where the tradition of Santa Claus delivering gifts to children originated. 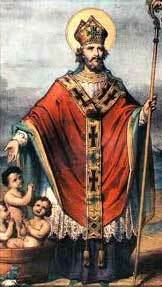 St. Nicholas is often depicted in art wearing the clothing of a bishop, including the mitre and staff. 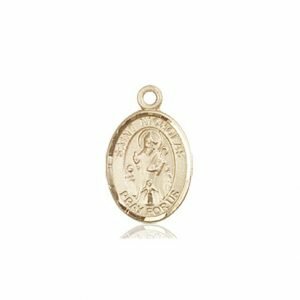 He often has a beard and sometimes is pictured with gold in remembrance of the story of him helping the man with the three daughters. 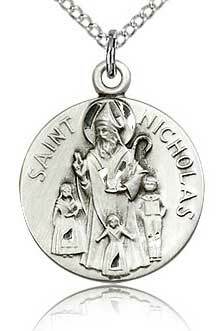 When portrayed in a religious medal, Saint Nicholas is almost always shown dressed as a bishop with mitre and crosier. 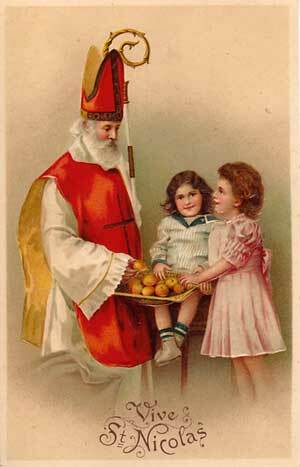 In addition, St. Nicholas pendants often show him with children or three balls or oranges. so that we, too, may be good followers of Jesus.